Enjoy our mobile field guide as you walk, hike and play in the fall forests. Take in the beauty of crunchy fallen leaves in the city and the forest and easily identify the trees from whence they came. Tulip trees (Liriodendron tulipifera), commonly referred to as Tulip Poplar, are abundant in the forest at the Schuylkill Center, and their mostly-yellow turning leaves roughly resemble the shape of a cat’s head or—as you might have noticed—a tulip! Another mark of a Tulip tree leaf is their glossy texture and symmetry. Querecus means “beautiful tree,” rubra “red,” and borealis, “north” in Latin. 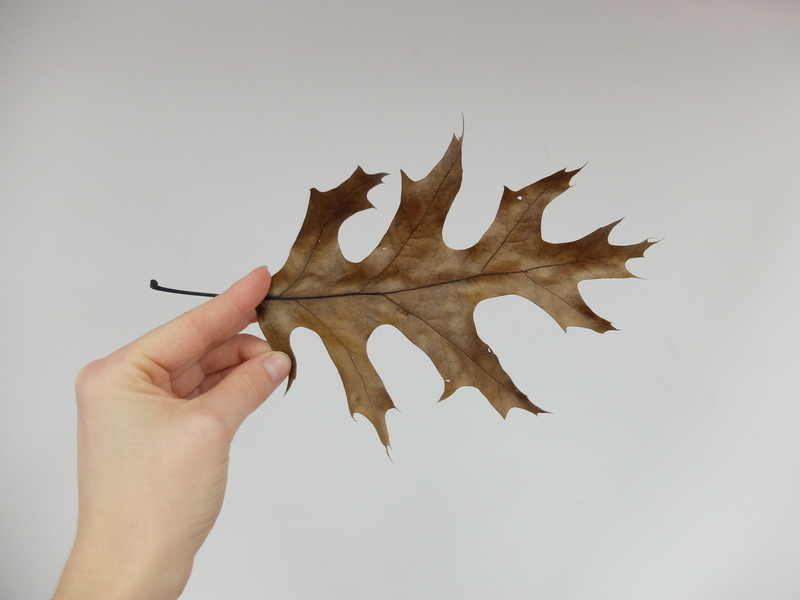 As opposed to white oaks, the lobes of the Red Oak’s leaves are pointed instead of round. 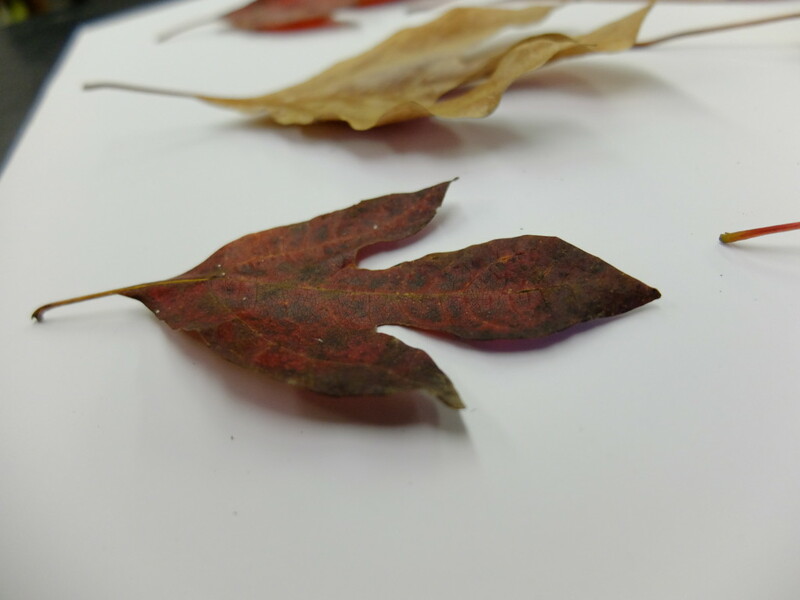 Red Oak leaves have 7-11 lobes and extend clearly off the center vein. You can find Red Oaks on the streets of Philadelphia, too, as they are able to resist salty sidewalks in the winter time. If the squirrels or deer haven’t eaten them up yet, you can also find bitter acorns among the crunchy Red Oak leaf piles. 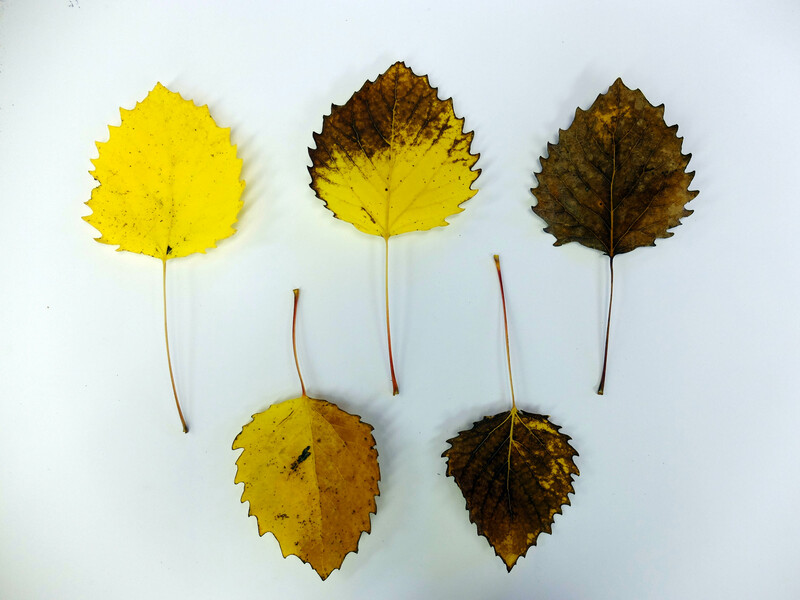 Big-tooth Aspen can be identified by their easy-to-spot “teeth” on the edges of their simple and relatively round leaf shape, coming to a point at the top. They are usually yellow in the forests this time of year, like many other native leaves. 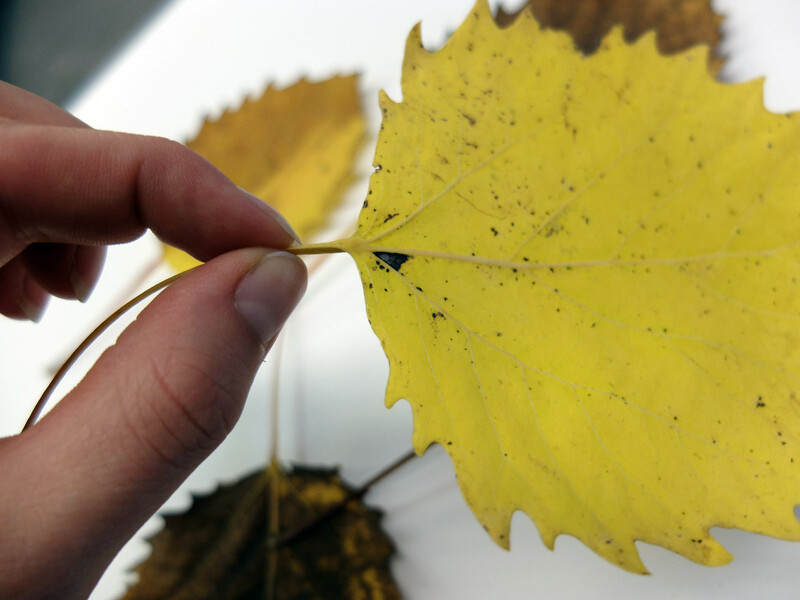 You know you’ve found an Aspen leaf, though, if its stem (petiole) is flattened and perpendicular to the surface of the leaf (see below). The flat stem makes the leaves quake at even the slightest breeze, hence the name of this leaf’s smooth-edged cousin, Quaking Aspen. 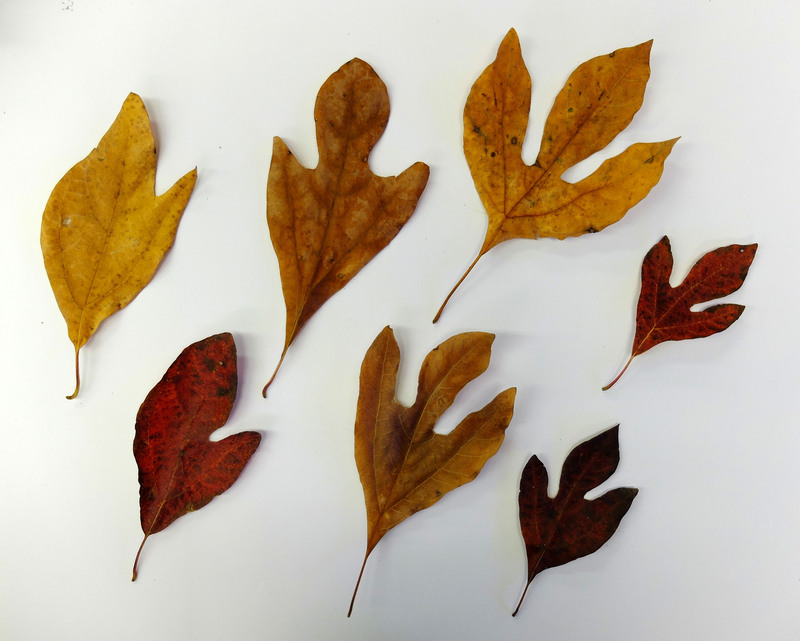 Sassafras is a quick one to identify—with their iconic two or three-lobed shape, sometimes they mimic the shape of a mitten, with one lopsided thumblike lobe and a larger one. Either they’re mitten-like, or they resemble something like a three-toed dinosaur footprint, with three distinctly deep lobes. Catch them in any number of their swiftly changing color palettes—from red-brown to yellow-green. I’m not usually one to play favorites, but… this might just be my favorite fall leaf. 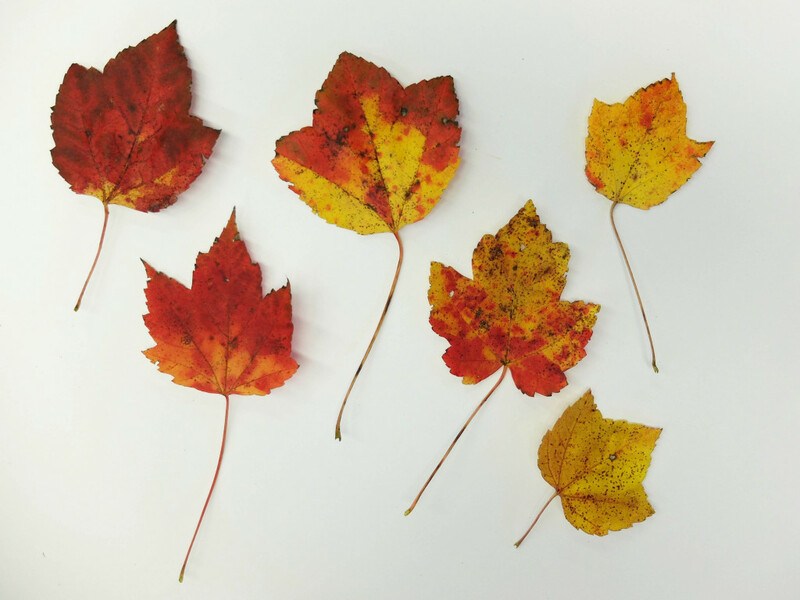 The colors on the leaves of the Red Maple this time of year could be likened to a paint-splattered canvas, blending gorgeous shades of yellow, rich reds, and orange. Sometimes, they’ll have three gentle lobes and other times, two more will tooth out at the bottom for a more recognizable maple shape. They range about 2 to 4 inches wide and tall, and are quite flexible and soft in texture—great for pressing in a book and saving for a dreary winter day. You might recognize the Red Maple’s silhouette from our Schuylkill Center logo at the top of the page! Here on the trails at the Schuylkill Center, the biggest leaf you’ll find likely fell from a Sycamore tree. 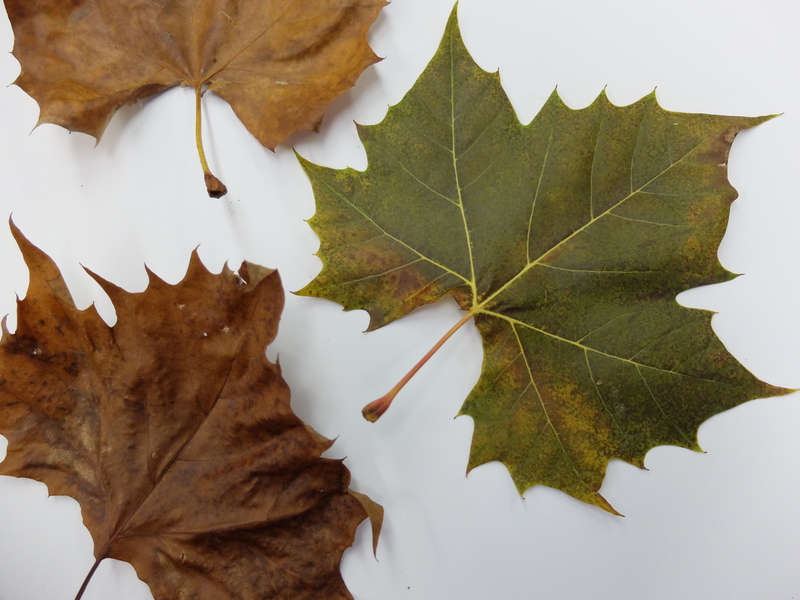 These look a lot like the familiar shape of a maple leaf, with 3-5 lobes, but with bigger teeth around the edges. Although they normally range from 4 to 9 inches long, staff at the Center have found ones much larger than our faces—up to fourteen inches! Their stems are noticeably enlarged at the end, too, which encase the buds when still attached to the mother tree. Sycamores, also commonly known as buttonwood trees, and are proud members of one of the oldest tree families, Platanaceae, which dates back over 100 million years. This entry was posted in Field Guide, Nature. Bookmark the permalink. Nice post, gorgeous photos. Sassafras is my own favorite. It’s been historically renowned for its medicinal qualities & can be brewed into a killer root beer. Informative and nice pics! Great job! After taking in each of the leaves in your guide, I think my fav is Ms. Sycamore. She’s so elegant.